How to Create “Faux” Mercury Glass with Krylon’s Looking Glass Spray Paint! I am so excited to be teaming up with Krylon to show you how to make faux mercury glass. And it’s so easy! Don’t you love the look of Mercury Glass?? But it can be so expensive. Now you can turn practically anyglass surface into mercury glass. Krylon sent me some of their Looking Glass Spray Paint. I was so excited to try it out. I’ve tried to make mercury glass before with other brands of spray paint and have been unimpressed with the results. The thing I love about Krylon’s Looking Glass Spray Paint is that it is so SHINY! It really makes all the difference. It can turn ANY glass surface into a reflective, mirror-like finish. I have been wanting to find a tall lamp for my living room. So the other day when I spied this glass lamp base at Lowes, I thought it would be perfect to try out the Mercury Glass technique! Tape off the outside of your surface, so you don’t get any paint on the outside. Then mix 1 cup of water with 1 cup of vinegar in a spray bottle. Spray the inside of your object. In this case, I sprayed the inside of my lamp. Then immediately spray a small amount of the water/vinegar mixture. This creates the mercury effect. Let dry at least an hour. Do this 2-4 more times, depending on the look you want. You can add another layer of spray paint inside your object – like gold or black. Or you can leave it a little see-through. I left mine without another layer of paint. For the shade all I did was add some ribbon to the top and the bottom of the shade. And that is it. It’s super easy!! You can also use Krylon’s looking glass spray on it’s own for a very bright and shiny look. I also used it to create a faux mercury glass shade for the #1905Cottage’s back bedroom. I sprayed the base of the light fixture with the plain Krylon Looking Glass Spray and then I used the vingear/water mixture on the shade to create a Mercury Glass effect. And for $8 – it’s a great little light fixture! And be sure to check out the project from Carmel at Our Fifth House – I can’t wait to see it!! Have you ever tried to create Mercury Glass?? Or can you think of a project to make with Krylon’s Looking Glass Spray Paint? Let me know YOUR ideas in the comments — I would love to know what YOU would create! Disclosure – this post is sponsored by Krylon. All ideas and opinions are all mine. 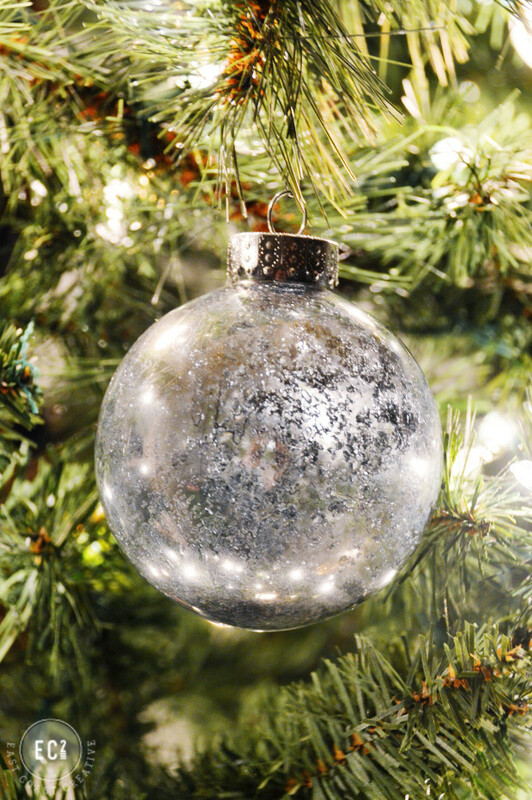 Mercury Glass Paper Christmas Trees Tutorial! Link Party Palooza — and Clorox Giveaway! Great Ideas — 27 Light & Bright Holiday Decor Projects! Great post! Now, if you need to wash your lamp by hand, would the Krylon Looking Glass paint peel off, or is it set that way permanently? I want to use this technique for votives, and I’d like to know if washing them in dish soap would ruin the effect. Lamp looks great! Did Krylon give instructions, or did you experiment with how to paint the inside of tighter spaces? I tried to do a glass candlestick that is hollow on one end and am having problems hitting all the spots. Also with it running on the other spots the spray hits when trying to reach the the tighter spots above. Do they have canned (non-spray) i could just pour in and roll around and pour out? I couldnt find any non-spray online. Any advice appreciated! Hi Jen. I always find great ideas on your website! I’m considering using this mercury glass technique on a glass top endtable. What do you think? Any suggestions? I’d like to the bring in a bit of gold, too. Any advice is appreciated. Gwen recently posted…10 Simple Tips to Have a Healthy Holiday Season! I just finished a faux mercury glass project on an old frame. I was not aware of this technique. I wish I had seen your post first. I’m a bit confused with your instructions . . . did you spray the looking glass paint first, and then the water/vinegar mixture? My method called for spraying the water first, and then the paint. You can do it either way. I sprayed the paint first and then the water/vinegar mixture. Jen recently posted…Great Ideas — 22 Happy & Joyful Holiday Ideas! I have glass lamps waiting for a makeover. How about dusting/cleaning this surface? I like easy maintenance! Thanks. Jen, This really gives me so many ideas to update a few items I have that are time worn or warped. I also can think of many gifts to make out of a favorite………..Dollar Store Items. Thank you so much for sharing your Glass Mercury Bling with us. I can not wait to try the Krylon Looking glass Spray paint. I think you will love it Karen! Jen recently posted…Great Ideas — 27 Light & Bright Holiday Decor Projects! Question — do you think you can get the same mercury effect using non-glass lamps? I found some awesome brass lamps on craigslist for $5 (set). I’d love to use a similar affect. Beth, if you tried painting the brass lamp, please post a link to pics…I’d love to see how it turned out. I’m trying both! Oh, the lamp is beautiful!!! I am definitely going to try this!!! Thanks Judith!! Yes, try it. It’s so easy! Thanks for sharing this! I have been wondering how the looking glass paint would turn out… You’ve talked me right into it! Mercury glass is amazing. Can’t wait to try this! Thanks Mandy!! I think the key definitely is the paint. It really makes a difference. This is so cool!!! Awesome lamp makeover! I am so getting myself some of this spray paint! Thanks Selene! It really is awesome stuff. Love the look of this product – can’t wait to try it! Happy Holidays! Thanks!! Yes, I think the key to making it look like real mercury glass is the paint.